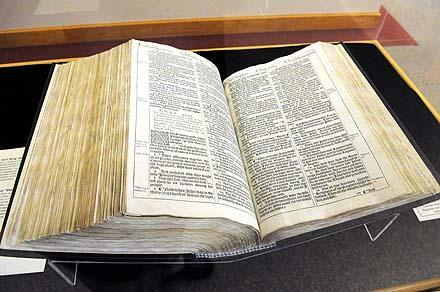 Hope is one of only 40 sites nationwide and the only location in Michigan chosen to host the exhibition, which was organized to celebrate the 400th anniversary of the first printing of the King James Bible in 1611. The related local programming, 10 events sponsored by the libraries at Hope and Western Theological Seminary as well as Herrick District Library, will span the run of the exhibition, beginning with the opening day. The public is invited to the exhibition and the other activities. Admission is free. “Manifold Greatness” tells the story of the origins, creation, and impact of the King James Bible, including its influence on English and American literature, and its multifaceted impact on culture and society to the present day. Displayed on 14 panels, the exhibition consists of high-quality reproductions of rare and historic books, manuscripts and works of art from the collections of the Folger Shakespeare Library and Bodleian Library of the University of Oxford, combined with interpretive text and related images. The exhibition will be displayed on the Van Wylen Library’s main floor and will include an accompanying exhibit of rare books from the library’s rare book collection. The additional presentations being organized in conjunction with the exhibition will expand upon a variety of themes addressed in the exhibition. They will take place at a variety of locations. The events will begin with the lecture “Text and Context: Politics and Culture in the Britain of King James” on Friday, March 2, at 3 p.m. in Winants Auditorium of Graves Hall by Dr. Marc Baer, who is a professor of history and chairperson of the department at Hope. A reception and the opening of the exhibit will follow from 4:30 p.m. to 6 p.m. at the library. On Monday, March 5, at 6:30 p.m., Kari Miller Fenwood will present “Family Treasures: a workshop/lecture on the Care and Restoration of Bibles and Other Rare Books” at the Herrick District Library. Fenwood is president and owner of Kari Miller Restoration. On Tuesday, March 6, at 11 a.m., the Rev. Dr. Trygve Johnson will present “Preaching the Manifold Greatness” in Winants Auditorium of Graves Hall. Johnson is the Hinga-Boersma Dean of the Chapel at Hope. On Thursday, March 8, at 11 a.m., Dr. Pablo Alvarez will present “The First Editions of the King James Bible: Misprints and Misfortunes” in the Granberg Room of the Van Wylen Library. Alvarez is outreach librarian and curator: special collections library at the University of Michigan. On Monday, March 12, at 4 p.m., Makoto Fujimura will present “On Visual Theology: My Journey with Illumining the Four Holy Gospels” in Winants Auditorium of Graves Hall. Fujimura is a visual artist, writer and speaker who will be speaking through the college’s World Christian Lecture Series. On Monday, March 12, at 6:30 p.m., Dr. Anne Heath-Wiersma will present “To See with a Vision Surpassing All Other Visions: the Medieval Tradition and Influence of Biblical Illustration on the King James Bible” at the Herrick District Library. Heath-Wiersma is an assistant professor of art and director of the De Pree Art Center gallery at Hope. On Thursday, March 15, at 3 p.m., Dr. Curtis Gruenler will present “A Dark Speaking: English Translations of 1 Corinthians 13:12 and What We Can See in Them” in the Rare Book Reading Room of the Van Wylen Library. Gruenler is a professor of English at Hope. On Tuesday, March 20, at 1 p.m., Dr. Eugene Heideman will present “The Geneva Bible and the KJB” in Winants Auditorium of Graves Hall. Heideman is a former faculty member at Western Theological Seminary and retired from the Reformed Church in America staff. The presentations will conclude on Thursday, March 29, at 3 p.m., when Dr. John Cox will present “The Bible and Shakespeare” in Winants Auditorium of Graves Hall. Cox is the DuMez Professor of English at Hope. “Manifold Greatness: The Creation and Afterlife of the King James Bible” was organized by the Folger Shakespeare Library, Washington, D.C., and the American Library Association Public Programs Office. It is based on an exhibition of the same name developed by the Folger Shakespeare Library and the Bodleian Library, University of Oxford, with assistance from the Harry Ransom Center of the University of Texas, to mark the 400th anniversary of the publication of the King James Bible. The traveling exhibition was made possible by a major grant from the NEH. The additional presentations taking place between March 2 and 29 are funded in part by the Michigan Humanities Council. The Van Wylen Library is located at 53 Graves Place (11th Street), between 10th and 12th streets on College Avenue, with access to the main floor through the building’s south side. The regular library hours are: Mondays-Thursdays from 8 a.m. to midnight, Fridays from 8 a.m. to 6 p.m., Saturdays from 10 a.m. to 6 p.m., and Sundays from noon to midnight. The library will operate with reduced hours from March 15 through March 24 due to the college’s spring break, open from 8 a.m. to 5 p.m. on Thursday and Friday, March 15-16; closed on Saturday and Sunday, March 17-18; open from 9 a.m. to 6 p.m. on Monday-Friday, March 19-23; and closed on Saturday, March 24. Graves Hall is located at 263 College Ave., between 10th and 12th streets. Herrick District Library is located at 300 River Ave., on River Avenue between 12th and 13th streets.